Open Garden on June 12th – a date for your diary! 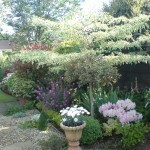 This year the Open Garden event will take place on June 12th at 40 Templeroan Avenue in Knocklyon. The garden will open from 10am until 4pm and entrance is €5. There will be tea, coffee and plenty of home-made goodies. Tickets for our annual raffle will be on sale on the day. With 15 superb prizes including a weekend for two people in London, no doubt they will sell out fast! Tickets will cost €10 for a book of 5, and there will be a limited number of goodie bags for early purchasers on the day. The garden will open, rain or shine and all proceeds will go to the Sam McMahon Trust and the Friedreich’s Ataxia Research Alliance (FARA). Andrew Rudd cooks up a storm! !